We just experienced another wonderful week of fishing. Our water conditions have been great, for once the weatherman was accurate. Our rivers are all at mid June levels and we are travelling the rivers with canoes. Higher water forces fish to move and we now have salmon in our high and medium water pools. New fish in new pools means one thing, they want the fly! The Bonaventure and Petite Cascapedia have been fishing very well. The Grand Cascapedia has been low but for the past month but the rain has given it new life and the fishing has been great. We are beginning to see our first fall run fish showing up, the full moon and high tides combined with high water levels should bring the late run of fresh salmon. 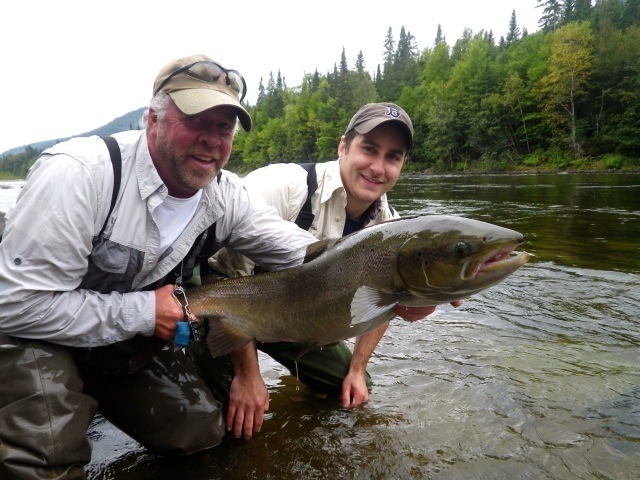 Henrik Mortensen releases a bright salmon back in to the Bonaventure, these fish are the first ones of the fall run. Our water temperatures are in the low 50 degree range and dry fly's have been working the best. Yesterday our guide Marc Poirier was fishing at Jug pool on the Bonaventure. His guests threw wets from sizes 4 to 12 in every pattern you can imaging, without even a rise.....Time for dry's Marc said. One of the anglers said "Marc, the water is stained and cold, do you really think a dry fly will work? Can't do any worse than what we've been using. Marc tied on a number 2 Green Bomber and had three fish landed with in the next hour! Soren Hjortgaard from Denmark releases a fresh one back into the Petite Cascapedia, Nice salmon Soren! Jan Tryx releases his first Bonaventure salmon, Congradulations Jan! With the present conditions next week should be excellent. 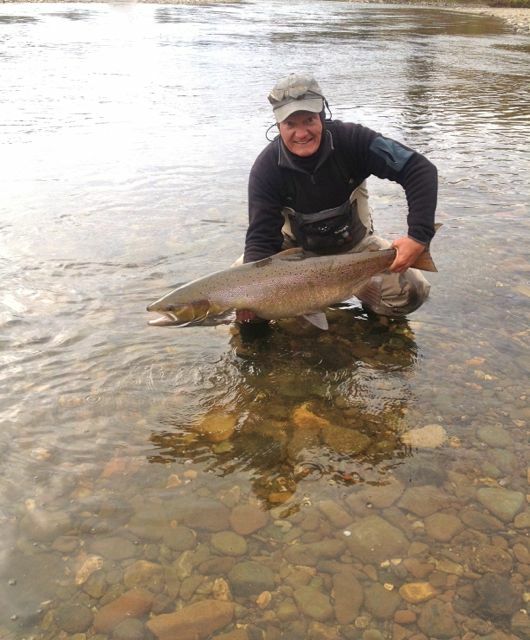 Stefan Borgstrom with his first Grand Cascapedia Salmon, this was his first of many for the week! Nice job fishing Stefan!